Members of the urokinase-type plasminogen activator (uPA) system are up-regulated in various solid malignant tumors. High antigen levels of uPA, its inhibitor PAI-1 and its receptor uPAR have recently been shown to be associated with poor prognosis in soft-tissue sarcoma (STS) patients. However, the mRNA expression of uPA system components has not yet been comprehensively investigated in STS patients. The mRNA expression level of uPA, PAI-1, uPAR and an uPAR splice variant, uPAR-del4/5, was analyzed in tumor tissue from 78 STS patients by quantitative PCR. Elevated mRNA expression levels of PAI-1 and uPAR-del4/5 were significantly associated with clinical parameters such as histological subtype (P = 0.037 and P < 0.001, respectively) and higher tumor grade (P = 0.017 and P = 0.003, respectively). In addition, high uPAR-del4/5 mRNA values were significantly related to higher tumor stage of STS patients (P = 0.031). On the other hand, mRNA expression of uPA system components was not significantly associated with patients' survival. However, in STS patients with complete tumor resection (R0), high PAI-1 and uPAR-del4/5 mRNA levels were associated with a distinctly increased risk of tumor-related death (RR = 6.55, P = 0.054 and RR = 6.00, P = 0.088, respectively). Strikingly, R0 patients with both high PAI-1 and uPAR-del4/5 mRNA expression levels showed a significant, 19-fold increased risk of tumor-related death (P = 0.044) compared to the low expression group. Our results suggest that PAI-1 and uPAR-del4/5 mRNA levels may add prognostic information in STS patients with R0 status and distinguish a subgroup of R0 patients with low PAI-1 and/or low uPAR-del4/5 values who have a better outcome compared to patients with high marker levels. Soft-tissue sarcomas (STS) are malignant mesenchymal neoplasias with an incidence of about 1% among all human malignancies . STS enlarge leading to the appearance of a pseudo capsule composed of an inner compression zone and an outer reactive zone at formation of fingers, which give rise to satellite lesions several centimeters away from the primary tumor . The major clinical problems in the treatment of STS are the propensity of the tumor to recur locally, and the fact that many patients without obvious clinical metastases harbor occult micro-metastases that become clinically evident. Lymph node metastases are rare in STS patients [3, 4]. Despite adequate local control of the primary tumor, about 50% of sarcoma patients will succumb to distant metastatic disease . The urokinase plasminogen activator (uPA) system has been shown to play a major role in the pericellular network of interacting proteolytic systems that are able to degrade extracellular matrix components and facilitate tumor invasion and metastasis [6, 7]. Furthermore, components of the uPA system have been implicated in proliferation, migration and adhesion of tumor cells as well as in tumor angiogenesis [8, 9]. Components of the uPA system, which consists of the serine protease uPA, its receptor uPAR and its principal inhibitor PAI-1 are prognostic factors in different types of cancer. High antigen levels of uPA and/or PAI-1 protein in tumor tissue extracts are strong predictors of poor prognosis in patients afflicted with different types of solid malignant tumors including sarcomas [10, 11]. High uPAR levels are also associated with poor prognosis in various cancer types, however, the prognostic impact of uPAR expression is not as pronounced as that of uPA and PAI-1 [12, 13]. In contrast, the expression of a mRNA splice variant of wild-type uPAR (uPAR-wt) lacking exons 4 and 5 (uPAR-del4/5) has been demonstrated to be a highly sensitive, independent prognostic marker in breast cancer patients [14–16]. Whereas wild-type uPAR consists of three structurally homologous domains, in the uPAR-del4/5 variant the complete domain II of uPAR is deleted, and the uPAR-del4/5 protein does not interact with either of its ligands uPA or vitronectin . However, in breast cancer cells the overexpression of the uPAR-del4/5 protein profoundly affects the in vitro invasion capacity of cells through a Matrigel matrix, the adhesion to extracellular matrix proteins and also lung colonization in an in vivo metastasis model. These observations strongly suggest that uPAR-del4/5 displays biological activity modulating tumor biological relevant processes . In sarcomas, high expression of uPA and uPAR antigen as detected by immunohistochemistry has been reported to be an independent prognostic factor for metastasis-free survival and overall survival in chondrosarcoma patients . In soft-tissue sarcomas, increased uPA protein levels in tumor tissue were found to significantly correlate with local recurrence and metastasis in a cohort of 69 STS patients . We recently reported a highly significant correlation between high antigen levels of uPA, PAI-1 or uPAR in tumor tissue, and of soluble uPAR in serum, with poor outcome of STS patients . However, only one report has investigated the mRNA expression of components of the uPA system in tumor tissue from soft-tissue sarcoma patients . In this study, which included 38 STS patients, significantly higher uPA, PAI-1 and uPAR mRNA expression levels were observed in tumor tissue compared to paired adjacent normal tissue. Additionally, PAI-1 mRNA expression was found to be 6-fold higher in metastatic tumors than in non-metastatic tumors . In the present study, we determined the mRNA expression levels of uPA, PAI-1 and uPAR in a cohort of 78 adult STS patients and analyzed their relationship with prognostically relevant clinical and histomorphological parameters and disease-associated survival. Furthermore, the impact of mRNA expression of uPA system components on disease-associated survival was evaluated in clinically relevant subgroups of STS patients with complete (R0) or non-radical (R1) tumor resection. For the present study, tumor tissue samples of 78 adult patients with histologically verified soft-tissue sarcomas that have been described in previous studies were used [20, 22]. The study adhered to national regulations on ethical issues and was approved by the Ethics Committee from the Medical Faculty of the Martin-Luther-University Halle-Wittenberg, Germany. All patients gave written informed consent (Institute of Pathology, University of Halle-Wittenberg, Germany and Department of Surgery 1, University of Leipzig, Germany). The median age of the patients at surgery was 59 years (range 22-83 years). The median follow-up time of the patients was 42 months (range 2 to 146 months after primary tumor resection). During that time, 30 patients experienced a locoregional recurrence, seven developed a distant metastasis and 42 of the patients have died. The tumors were staged according to the UICC system. All of the tumor samples were collected before radio- or chemotherapy. Relevant data on the clinical and histomorphological parameters of the STS patients are shown in Table 1 and in Additional file 1 .
aThe number of cases for uPAR-wt and uPAR-del4/5 is 77 and 76, respectively. b P for Mann-Whitney U test, c P for Kruskal-Wallis test. dAbbreviations: LS - liposarcoma, MFH - malignant fibrous histiocytoma, FS - fibrosarcoma, RMS - rhabdomyosarcoma, LMS - leiomyosarcoma, NS - neurogenic sarcoma, Syn - synovial sarcoma; the median mRNA values of the uPAR system components in the different histological STS subtypes are presented in Additional file 3. Tissue processing, isolation of total RNA, cDNA synthesis, and evaluation of the quantity and quality of the isolated RNA were performed as described . Among the 78 STS patients, the mRNA expression in tumor tissue could be investigated in all cases for uPA and PAI-1 expression, in 77 cases for expression of wild-type uPAR (uPAR-wt) and in 76 cases for expression of the uPAR splice variant uPAR-del4/5. For quantification of uPA, PAI-1, uPAR-wt and uPAR-del4/5 mRNA, gene-specific hybridization probes and highly sensitive RT-PCR assays (LC FastStart DNA Master Hybridization Probes, Roche Diagnostics, Mannheim, Germany) applying LightCycler technology (Light Cycler 1.0; Software Version 3.5, Roche) were used as previously described [14, 23]. Briefly, the PCR assays were performed using 2 μl of a 1:10 dilution of the respective cDNA products. Primer sequences, concentration of primers and probes as well as PCR conditions for amplification are shown in Additional file 2. All HPLC-purified primers were purchased from TibMolBiol (Berlin, Germany). Five-log-range calibration curves were generated for each PCR run using eight glass capillaries coated with defined numbers of linearized plasmid molecules (101 - 106 molecules), carrying either the uPA, the PAI-1 or the uPAR (wild-type or -del4/5) cDNA (Roboscreen, Leipzig, Germany). All measurements were performed using aliquots of the same cDNA dilutions within short time intervals to ensure comparable conditions. The cDNA samples were quantified at least in duplicate in independent PCR runs for the appropriate marker transcripts. The mean values of all measurements were used for further calculations. The levels of specific mRNAs were evaluated relative to the average expression levels of the medium abundance housekeeping gene hypoxanthine guanine phosphoribosyltransferase (HPRT) as described . Relative mRNA expression ratios (amol of appropriate marker per amol HPRT) were used for all further calculations and statistical analyses. The levels of significance between continuous variables of the biological markers were calculated with Spearman's rank correlation test (rs). The relationship between biological marker expression levels and clinical and histomorphological parameters was evaluated using non-parametric Mann-Whitney or Kruskal-Wallis tests. For survival analyses the disease-associated survival of STS patients was used as the follow-up end point. The disease-associated survival was defined as the time from the day of primary surgery to tumor-related death of the patients. Statistical analyses of the association between mRNA expression of uPA system components and prognosis were performed by Kaplan-Meier analyses (log-rank tests) and using the Cox proportional hazard regression model. The multivariate Cox regression model was adjusted for the following known clinical prognostic factors in STS patients: tumor stage, histological subtype, type of tumor resection, and tumor localization. All calculations were performed using the SPSS 17.0 program (SPSS-Science, Chicago, IL). P-values < 0.05 were considered statistically significant. The expression of uPA and PAI-1 mRNA was determined in 78 cases, and the expression of uPAR-wt and uPAR-del4/5 mRNA was determined in 77 and 76 STS samples, respectively (Table 1). The normalized mRNA expression values of uPA, PAI-1, uPAR-wt and uPAR-del4/5 ranged from 0-16.2 (median 0.23; 25th and 75th percentile 0.055 and 1.03, respectively), from 0-181.9 (median 0.73; 25th and 75th percentile 0.10 and 3.08, respectively), from 0-24.1 (median 0.18; 25th and 75th percentile 0.044 and 1.15, respectively), and from 0-0.29 (median 0.004; 25th and 75th percentile 0.0001 and 0.012, respectively), respectively. For statistical analysis, the median value was set as the cut-off point to separate STS patients in groups with low or high tissue mRNA expression. First, the correlation between the mRNA expression levels of the biological markers was analyzed using Spearman's rank correlation. In general, all factors displayed a strong correlation with each other with rs-values of approximately 0.80; uPA mRNA values significantly correlated with PAI-1 (rs = 0.82, P < 0.001), with uPAR-wt (rs = 0.81, P < 0.001) and with uPAR-del4/5 (rs = 0.74, P < 0.001) mRNA levels. In addition, significant correlations were found between uPAR-wt mRNA levels and both PAI-1 and uPAR-del4/5 mRNA values (rs = 0.85, P < 0.001, and rs = 0.82, P < 0.001, respectively) as well as between PAI-1 and uPAR-del4/5 mRNA values (rs = 0.78, P < 0.001). The relationship between the mRNA expression levels and the clinical and histomorphological parameters of the STS patients is summarized in Table 1. A significant association was observed between mRNA expression levels of PAI-1 (P = 0.037), uPAR-wt (P = 0.044) and uPAR-del4/5 (P < 0.001) and the histological subtype of STS patients. High mRNA expression levels of these three markers (and of uPA) were observed, especially in leiomyosarcomas. Furthermore, mRNA levels of PAI-1 (P = 0.017) and uPAR-del4/5 (P = 0.003) were significantly related to tumor grade, and high uPAR-del4/5 mRNA values were associated with a higher tumor stage in STS patients (P = 0.031). In contrast, mRNA levels of uPA did not differ significantly between tumors in relation to clinical and histomorphological parameters (Table 1). The association of clinical and histomorphological parameters and tumor biological factors with disease-associated survival is presented in Table 2. In univariate Cox regression hazard analysis, two of the clinical parameters, tumor stage and tumor resection status were significantly related to prognosis, i.e. patients with high stage tumors or with tumors that were not completely resected (R1) had, as expected, a higher risk for tumor-related death (Table 2). No significant association between uPA, PAI-1, uPAR-wt and uPAR-del4/5 mRNA values with disease-associated survival of STS patients was observed in both univariate (Table 2) and multivariate Cox regression analyses (data not shown). aTotal number of cases: n = 78, the number of cases for uPAR-wt and uPAR-del4/5 is 77 and 76, respectively. bRR: hazard ratio (95% confidence interval) of univariate Cox regression analysis. cAbbreviations: LS - liposarcoma, MFH - malignant fibrous histiocytoma, FS - fibrosarcoma, RMS - rhabdomyosarcoma, LMS - leiomyosarcoma, NS - neurogenic sarcoma, Syn - synovial sarcoma. dRelative mRNA expression ratio of the respective marker / HPRT dichotomized in high and low levels by median values. We next performed analyses in the subgroup of STS patients with complete tumor resection (R0) who were at lower risk for tumor-related death compared to the patients whose tumors were not completely resected (R1, Table 2; ). We assessed whether some of the biological markers might add prognostic information for patients' survival in the R0 subgroup of STS patients. In R0 patients, survival time is inversely significantly correlated with expression of PAI-1 mRNA (rs = -0.337, P = 0.014) and of uPAR-del4/5 mRNA (rs = -0.346, P = 0.013) by bivariate correlation analysis using Spearman's Rho test (Additional file 3: A). Furthermore, using linear regression analysis about a third of patients with lower expression rates for both markers showed the best survival (Additional file 3: B). Therefore it was implicated to apply the 33% percentiles as cut-off points for R0 patients according to their mRNA expression levels, i.e. for PAI-1 (33% percentile: 0.228) and for uPAR-del4/5 mRNA expression (33% percentile: 0.001). Accordingly, R0 patients (n = 52) with mRNA values in the range of the 0% to the 33% percentile were allocated to the low expressing group, and all other patients with mRNA values above the 33% percentile (>33% to 100%) were designated as the high expressing group. We found an association between high PAI-1 and uPAR-del4/5 mRNA expression levels and an increased risk of tumor-related death for R0 patients using multivariate Cox regression analysis with relative risks (RR) of 6.55 (95%CI = 1.0-44.5) and 6.00 (95%CI = 0.8-47.1), respectively, with a trend towards significance (P = 0.054 and P = 0.088, respectively; Table 3). A moderately increased risk of tumor-related death in R0 patients was also observed for high uPA and uPAR-wt mRNA values (RR = 3.53, 95%CI = 0.7-16.8, and RR = 2.66, 95%CI = 0.5-14.4, respectively). However, this risk was not significantly different than for R0 patients expressing low uPA or uPAR-wt mRNA levels (Table 3). aTotal number of cases: n = 52, the number of cases for uPAR-del4/5 is 51.
bRR: hazard ratio (95% confidence interval) of multivariate Cox regression analysis. dRelative mRNA expression ratio of the respective marker / HPRT divided into groups using the 33% percentile; Low: 0 - 33% percentile; High: > 33% - 100% percentile. eFactors were added separately to the base model of relevant clinical prognostic factors in STS patients including the histological subtype, tumor stage and tumor localization. Finally, we assessed whether a combination of PAI-1 and uPAR-del4/5 mRNA values might improve the prognostic impact for patients' survival. Again, the mRNA expression levels of both PAI-1 and uPAR-del4/5 were divided into groups with low (0-33% percentile) versus high (> 33% to 100% percentile) values, respectively. In multivariate Cox regression analysis, we found that patients with low mRNA values of both factors were characterized by a much better disease-associated survival than patients with tumors in which one or both mRNA values were high (Figure 1). R0 patients with high PAI-1/uPAR-del4/5 (n = 30) revealed a significant 19-fold increased risk of tumor-related death (RR = 19.1, 95%CI = 1.1-335.3, P = 0.044) compared to R0 patients who showed low PAI-1/uPAR-del4/5 mRNA expression levels (n = 13). Thus, a pronounced additive effect on prognosis of R0 patients was identified when combined PAI-1/uPAR-del4/5 mRNA expression levels in tumor tissue were used. The risk of tumor-related death for R0 patients with a low/high mRNA expression (high PAI-1/low uPAR-del4/5 and low PAI-1/high uPAR-del4/5) was not significantly different from that for R0 patients with a low PAI-1/uPAR-del4/5 mRNA expression in their tumors. We did not observe any significant correlation for either group with the disease-associated survival of all STS patients or for the R1 patients. The combination of other factors did also not provide any additional prognostic information. Multivariate Cox regression analysis for the association of combined PAI-1/uPAR-del4/5 mRNA values with disease-associated survival in the subgroup of STS patients with complete tumor resection (R0). For each, the PAI-1 and the uPAR-del4/5 mRNA level, the 33% percentile of the relative expression ratio was used as cut-off point. Group 1 (n = 13), low expression levels of PAI-1/uPAR-del4/5 mRNA; group 2 (n = 8), one of the mRNA values was either low or high; group 3 (n = 30), high expression levels of PAI-1/uPAR-del4/5 mRNA. R0 patients of group 3 (high expression of PAI-1/uPAR-del4/5 mRNA) showed a 19-fold increased risk of tumor-related death (RR = 19.1, 95%CI = 1.1-335.3, P = 0.044) compared to group 1 with low expression of PAI-1/uPAR-del4/5 mRNA. The uPA system is one of the best-investigated protease systems in both physiological and pathological conditions, including cancer [reviewed in [6, 7]]. In clinical studies, high protein contents of uPA and/or PAI-1 in tumor tissue have been shown to indicate an unfavorable prognosis in various types of cancer [10, 11, 26]. For example, the determination of antigen levels of uPA and PAI-1 in tissue extracts of primary breast cancer has entered clinical practice for risk-adapted, individual therapy decisions in patients with lymph node-negative disease [11, 26]. In soft-tissue sarcoma, however, few studies have analyzed the protein expression of uPA system components and evaluated the impact of expression of these proteins on prognosis of STS patients. Choong et al. reported that increasing uPA protein levels in tumor tissue were associated with local recurrence and metastasis in 69 STS patients. Recently, high protein levels of uPA, PAI-1 and uPAR in tumor tissue extracts were found to be significantly associated with a shortened disease-associated survival of STS patients; this association was independent of prognostically relevant clinical parameters . Moreover, combined values of high uPA, PAI-1 or uPAR tissue levels with high serum levels of soluble uPAR were highly significantly and independently associated with poor disease-associated survival; these patients showed an approximately 6-fold increased risk of tumor-related death . Generally, measurements of tumor biological markers in tissue extracts by ELISA require relatively large amounts of fresh-frozen tumor material as well as adequate storage capacities for tumor samples. Furthermore, tumor tissue material is more limited when the cancer is diagnosed at early stages because most tumor tissue specimens are retrieved from fine needle aspirates or core biopsies . Thus, alternative, less material-consuming methods for the quantitative determination of prognostic factors in tumor tissue such as quantitative PCR are desirable. In the present study, we analyzed the mRNA expression levels of uPA system components in a cohort of 78 patients with soft-tissue sarcoma, and high correlations were found between the mRNA values of uPA, PAI-1, uPAR-wt and an uPAR splice variant, uPAR-del4/5 (with rs values greater than 0.70). In agreement with these results, positive correlations between mRNA values of uPA system components have been observed in several other studies [23, 28–31]. At the protein level, similar significant correlations between uPA, PAI-1 and uPAR antigen levels in tumor tissue have been reported [20, 23, 30, 32, 33]. These findings may not be surprising because various interactions of the members of the plasminogen activation system may affect each other or are regulated in a concerted manner in tumor growth and metastasis. In contrast, we found only low/moderate correlations between uPA, PAI-1 and uPAR-wt mRNA expression and the respective antigen levels in tumor tissue from the STS patient cohort (rs values ranging from 0.26 to 0.35; data not shown). Other studies have also indicated that uPA and/or PAI-1 antigen levels in tumor tissue do not completely reflect the respective mRNA expression level [23, 28, 30, 34, 35]. This discrepancy could be due to posttranscriptional regulation processes, which have previously been reported for components of the uPA system . Although mRNA levels do not completely mirror antigen contents in tumor tissue, a number of studies have demonstrated that mRNA expression levels of certain uPA system members are linked with clinical and histomorphological parameters, and/or prognosis in cancer patients. In breast cancer, Witzel et al. have reported that patients with high PAI-1 mRNA expression have a reduced 10-year disease-free survival and overall survival rate, and PAI-1 mRNA expression might reveal additional clinically relevant information compared to PAI-1 protein levels. In other studies that have analyzed PAI-1 mRNA expression in different sets of breast cancer patients, high PAI-1 mRNA levels were found to be significantly associated with shorter metastasis-free or overall survival, whereas uPA mRNA levels had no prognostic relevance [37, 38]. However, in a subset of ErbB2-positive breast cancer patients, Urban et al. have identified uPA mRNA as the most significant marker associated with distant metastasis-free survival, whereas PAI-1 mRNA was found to be significantly associated with distant metastasis-free survival, independent of the ErbB2 status. In addition, high uPA and PAI-1 mRNA levels were found to be significantly associated with shorter disease-free survival in primary breast cancer patients, independent of hormone receptor or lymph node status . In other tumor types, such as pancreatic and gastric cancer, mRNA expression of uPA system components has also been found to be related to prognosis [31, 39–41]. However, the existence of studies in which no relationship was found between uPA, PAI-1 or uPAR mRNA expression and patients' survival is notable [30, 42]. Other studies have also examined uPA system components in soft-tissue sarcomas. In a small cohort of 38 STS patients, significantly higher PAI-1 mRNA expression levels, but not uPA or uPAR levels, were observed in metastatic compared to non-metastatic tumors . In the present study, uPA, PAI-1 and uPAR-wt mRNA values did not differ significantly between tumors in relation to clinical and histomorphological parameters, except for a significant relationship between high PAI-1 mRNA expression and tumor grade and between PAI-1 and uPAR-wt mRNA levels and the histological STS subtype, which has also been reported by others . Interestingly, mRNA levels of uPAR-del4/5, an uPAR mRNA splice variant described recently , were significantly correlated with clinical prognostic factors such as histological subtype, tumor grade and tumor stage in STS patients. However, the expression levels of uPAR-del4/5 mRNA, which has recently been shown to be strongly associated with prognosis in lymph node-negative breast cancer patients , had no prognostic impact in STS patients. Similarly, mRNA expression of the other uPA system markers did not show a significant correlation with disease-associated survival in the whole cohort of STS patients. However, when we analyzed the expression pattern of uPA system markers in the subgroup of STS patients who underwent radical tumor resection (R0) we observed a trend towards an association between mRNA expression and disease-associated survival. Specifically, elevated mRNA values of uPAR-del4/5 and PAI-1 were associated with a 6-fold increased risk of tumor-related death in R0 patients (but not in R1 patients). It is tempting to speculate that increasing the number of patients in this subgroup analysis would result in significant associations between high levels of uPAR-del4/5 or PAI-1 mRNA levels and disease-associated survival. Moreover, by using combined PAI-1 and uPAR-del4/5 mRNA expression values, R0-resected patients with high PAI-1/uPAR-del4/5 mRNA values had a significant, 19-fold increased risk of tumor-related death compared to R0-resected patients who displayed low PAI-1/uPAR-del4/5 expression levels. These results suggests that the quantitative determination of PAI-1 and uPAR-del4/5 mRNA expression levels in R0-resected STS patients provides additional prognostic information that may allow for individual, risk-adapted (adjuvant) therapy decisions. Thus, R0 patients at high risk, as identified by elevated uPAR-del4/5 and/or PAI-1 mRNA levels, may benefit from chemotherapy, which would result in the reduction of tumor progression. In contrast, patients displaying low mRNA expression of both uPAR-del4/5 and PAI-1 in tumor tissue could be spared the exposure to chemotherapy. In the present study, we analyzed mRNA expression levels of uPA, PAI-1, uPAR and an uPAR mRNA splice variant, uPAR-del4/5, in a cohort of 78 adult soft-tissue sarcoma patients. Our data suggest that mRNA levels of PAI-1 and uPAR-del4/5 are significantly related to clinical and histomorphological parameters of STS patients such as histological subtype, tumor grade or tumor stage. 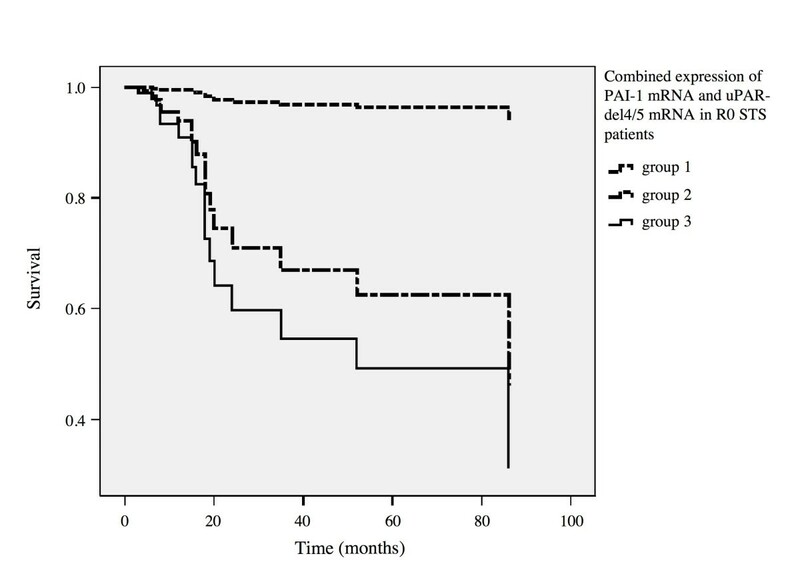 In addition, in STS patients with complete tumor resection high PAI-1 or uPAR-del4/5 mRNA levels are associated with a distinctly shortened disease-associated survival of STS patients. Strikingly, co-detection of a high mRNA level of uPAR-del4/5 and PAI-1 in tumor tissue of STS patients with complete tumor resection is associated with a 19-fold increased risk of tumor-related death suggesting that both markers can be considered together for prognostic evaluation and may support future therapy stratification. We thank Antje Zobjack for her excellent technical assistance. M.K. and V.M. were partially supported by a grant from the Deutsche Krebshilfe No. 108050 and No.107965, respectively. H.T. was supported by a grant from the Deutsche Krebshilfe No. 107590. The work was associated with the German Sarcoma Study Group K.O.S.A.R. MK, VM and HT designed the study, collected data, performed statistical analyses and drafted the manuscript. TG, MK, MB, CL, SF, AE, TL, and GB substantially contributed to data acquisition and analysis as well as data interpretation. PW treated the patients, collected the material and data, and reviewed the manuscript. All authors have read and approved the final manuscript version.